I bought this audiobook impulsively when Audible was having a sale and I was in the mood for memoirs. I had never heard of this one, but was intrigued by the description as it says she worked as a medical examiner in the wake of 9/11. Judy Melinek intended to be a surgeon, but the grueling schedule wasn't for her (and, to be honest, didn't sound like it was very healthy for her patients either.) So she quit her residency and began working as a forensic pathologist in New York in the summer of 2001. Mostly, the book was more thematic than linear, with chapters focused on different types of deaths like homicides, suicides, accidents, and those from substance abuse. She talks about her experiences performing autopsies, the things she looked for, and what she learned. It was about 3/4 of the way through the book when she talks about 9/11 and its aftermath. Although that was what reeled me in, and I was initially disappointed that it wasn't more of a focus of the book, I found everything about her job so fascinating that I'm glad she shared so much of it. Obviously 9/11 was a huge catastrophe, but what really set it apart from her other work was the scale, and the need to devise a different workflow. The actual work was similar, except that there were a lot of, um....incomplete bodies, which affected the organizational system. I'm not going to get more specific here because it goes into a territory that is not going to be comfortable for a lot of people. So that's one important thing to know about this book. It's pretty graphic, and it has to be in order to get a feel for what Melinek's job is actually like. 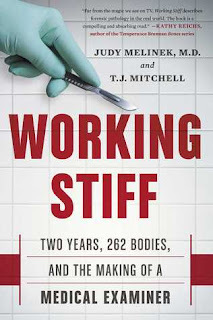 If you are easily grossed out or upset by things having to do with the human body, things that can happen to it, and vivid descriptions of horrific deaths, this is not the book for you. However, I find this kind of thing fascinating. And so does Judy Melinek. Of course she was affected by some of the things she saw. There was even one situation in which she paused over a body bag containing more than one small child (from a plane crash that happened just a couple of months after 9/11), and a coworker quickly volunteered to take that job. He knew she had young children. Mostly though, she wasn't bothered, and it didn't make her worry more for her family. She saw a lot of death and knew that the more horrific accidents were actually pretty rare. She's just extremely interested in the human body and loves learning more about it, and happens to not be especially bothered by dead people. She talked a lot about her mentors and what she learned from them, and she also touched on her father's death when she was a teenager and how that has shaped her view of suicide and affected how she interacts with the families who are left behind. It was a fairly short book (the hardcover edition is 258 pages) and the narrator was great, so I was pretty engrossed and flew through it. It was a great impulse buy and exactly what I wanted to listen to at the time. If you're interested in this kind of science, or just like learning about unusual jobs, I recommend it.